Going on a trip? I am. 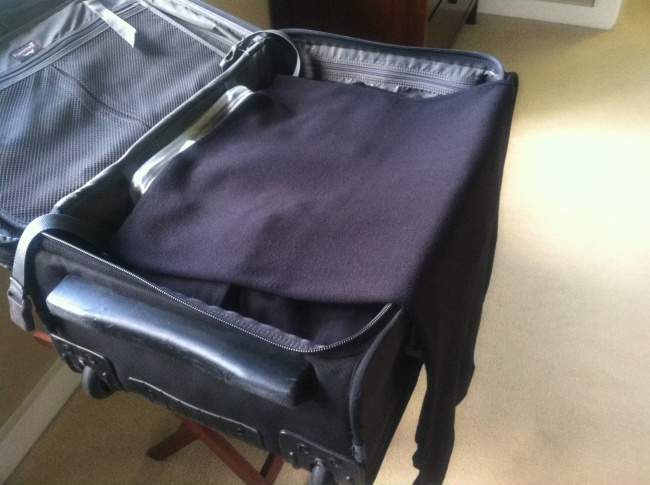 And my packing routine borders on religious ritual. I start about a week before my journey, laying out my outfits, deciding what to take. I have a pretty religious observance for all that too but as far as getting it into the suitcase, that’s the easy part. Many years ago I knew someone who trained to be a flight attendant. In those days the airlines had plenty of time to teach the crew how to pack a suitcase because they weren’t spending time teaching them what to do when someone has a bomb in their underwear. Having been carefully tutored in the airline-favored method of packing, I have used it ever since and found it to be, not only efficient, but practically guaranteed to allow my clothes to come out of the bag looking like they did before they went in, which is to say, ready to wear someplace other than to bed. And by the by, this method works for women AND men. The first trick is I pack shoes first. If you put socks and/or hose in the toes, shoes keep their shape and it saves valuable space later. I always put my shoes in shoe bags, mostly to protect my clothes, but it also helps to keep them compact. Many better-made shoes now come with their own cloth bag, but if you don’t have any of those, a small plastic will do. I’ve used about a million from “Ricky’s” in New York after I’ve bought shampoo. Then I fill in the gaps with other hard or odd shaped things like my cosmetics, my toiletries, a couple large bangle bracelets, my travel hairdryer. No travel hairdryer? For me this is a must. Although most hotels now provide them, I generally take my own since I know it won’t blast my hair into a Don King do in ten seconds. Brookstone has one that’s great. The Travel Smart by Conair is also really good and less money. Both are dual voltage for here or abroad. Then in the little spaces that are left I stuff in my underwear so that the result is a completely filled, and now level “shelf.” Then it’s time for my clothes. Forget the rolling up nonsense. I’ve never found that to work unless you want to walk around looking like you’re wearing a sleeping bag. I make a first layer with things like a lightweight, short bathrobe, a slip, swimsuit, maybe pajamas. Then, if I have pants I lay them across the bag so they are unfolded and hanging over each side. I put my shirts and sweaters in on top and then fold the ends of the pants over them. The tops make a cushion that the pants (or skirts for that matter) fold around to prevent wrinkles. If I have a dress to pack and there’s no removable suit bag or hanging system within the case, I keep it in the plastic bag minus the hanger and gently fold it on itself accordion style. I left the plastic off in these pictures; the better to illustrate. Ba-da-bing, ba-da-boom. Needless to say, it’s smart to unpack at your destination as soon as you can. I like to use drawers if they are available so I can see what I brought. And what exactly am I packing for this trip? Stay tuned!